Maisie Burden with her bronze medal. 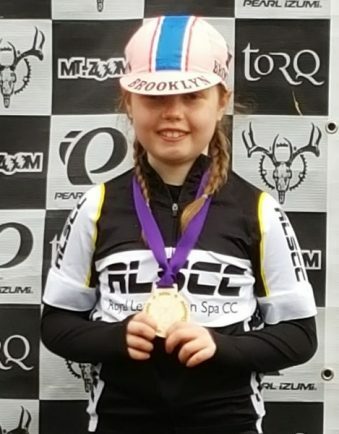 ROYAL Leamington Spa CC youngster Maisie Burden did the club proud after picking up third place in the under-eight category at the first round of the Midlands XC Series. Riding the challenging course held at Swynnerton Old Park in Staffordshire, Maisie rode well to secure he place on the podium. Maisie has been supported by the club through the Peddlamaniacs coaching programme. These are British Cycling approved training sessions which are held each week in term time for children aged between four and 16. “I was really happy to get a podium place and a medal,” said Maisie. “The first climb was really long and steep but I managed to ride most of it and run up the rest. “The top was really muddy, twisty and a bit slippy which was hard work but then there was a really fun long fast bumpy downhill bit. Elsewhere, Mike Snell took fifth place in the super veterans category.